Smith & Wesson brings their wealth of tactical knowledge to their line of premium knives. The CK110GL Executive Gold Titanium Folding Knife packs the look of a first class corporate executive with the performance of a tough officer in the field. 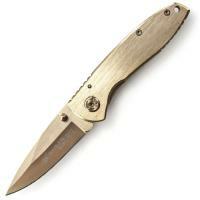 Both the blade and the handle are crafted of stainless steel and finished with a gold titanium coating. The impressive drop point blade offers an incredibly sharp point that is easy to maneuver for precision cutting and provides an ample cutting belly. Ambidextrous thumb knobs allow for easy one-handed opening while the frame lock prevents injury. Convenient carry options of the the Executive Folder are possible either with its pocket clip or lanyard hole.